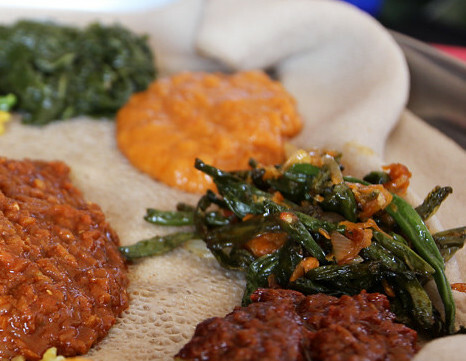 Hana Ethiopian food is one of the best Ethiopian food and We offer catering services for any event from weddings & anniversaries to private dinner parties. 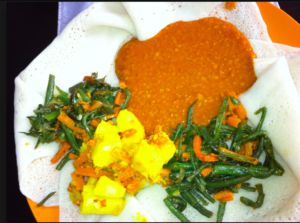 With Ethiopian cuisine, everyone eats with their fingers from the same tray. Eating with your hand, and perhaps trying the typical Ethiopian way of doing it- is a convivial, fun and romantic dining experience. We invite you to enjoy an authentic meal provided to you in the North side market of Fredericton. Ethiopian cooking can be heavy on meat but the east African country’s cuisine is also full of delicious and super-satisfying dishes that are perfect for vegetarian, vegan, and gluten and lactose-free eaters.We are located on the North side of Fredericton,New Brunswick; stop by and enjoy the deliciouse varity of Ethiopian food. One of the best things about Ethiopian food is that no other cuisine in the world is quite like it. Traditional cooking and blended unique combinations of spices to create distinct flavours; some hot and some savoury. Spices are the key ingredients for most of Ethiopian sauce that are eaten with flat, spongy bread called Enjera. If you are into multicultural experience and creativities, you should try the Ethiopian food because the key aspect of learning to adapt to a new culture is not that you have to decide which approach is better. Rather you recognize that everything in the world can be looked at in many different ways. The simplest example is, in some country-cultures or anywhere fast-food restaurants, mealtime means just to fuel the body or quickly get their food and they can move on to the next task. while other cultures treat mealtime as a time for social interaction in which the mealtime is extended to include discussion about some important scenario or generally about life and any other events.